The Congressional Medal of Honor (MOH) dates back to the Civil War when President Lincoln and Congress created it as our nation’s highest military decoration. A service member awarded the MOH is recognized for “conspicuous gallantry and intrepidity at the risk of life above and beyond the call of duty.” Every March 25, National Medal of Honor Day and for a week thereafter, the living recipients are recognized and celebrated for their great service to our country. During its 160 year history, of the slightly more than 3,500 recipients, only 72 are alive to today. "The week long celebration of 'service before self' was inspiring, said Paul W. (Bud) Bucha, an MOH recipient from the Vietnam War and a Veterans Advantage board member. We were greeted by warm and friendly people wherever we went who truly seem to appreciate the role of our military,” he added. 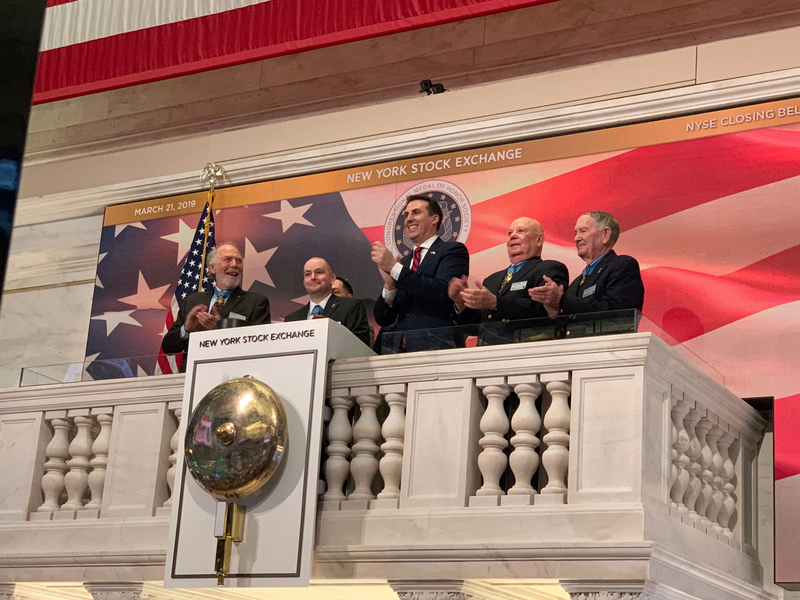 Recipients were first recognized in New York City when they rang the closing bell at the New York Stock Exchange and then again at the Circle of Honor Gala the following evening, hosted by the Congressional Medal of Honor Foundation. The Gala also recognized the 20th anniversary of the MOH Foundation. Veterans Advantage was a guest at both events. 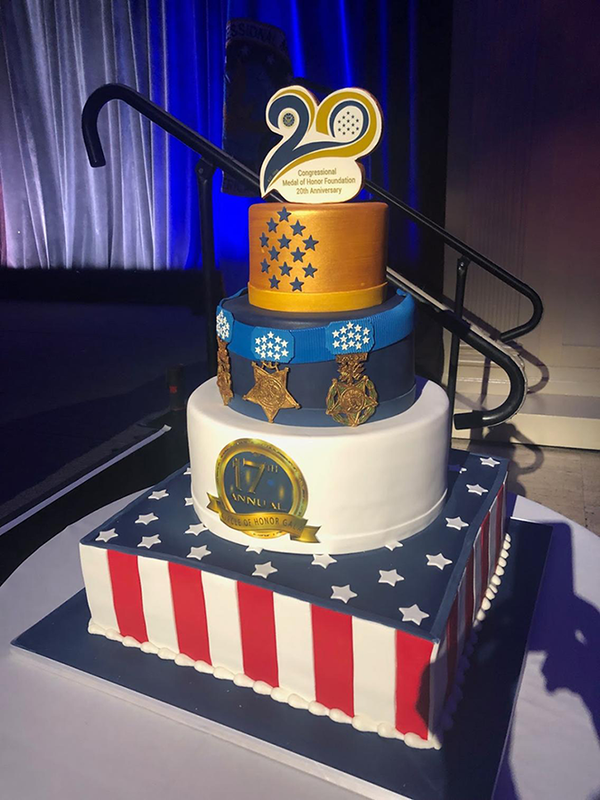 While in Washington DC, MOH recipients attended a wreath laying ceremony at the Tomb of the Unknowns, a USO Gala, and the Citizen Honors Award Banquet, which recognizes civilian acts of heroism. This year, the MOH Foundation recognized Parkland teenagers for their heroism during the shootings in Florida at the Marjory Stoneman Douglas High School in February, 2018. “The highlight of the week for me was the Citizens Honors dinner in Washington, DC. The room exploded as the Parkland teenagers received their awards. It was great seeing unrestrained joy bridging the generations in the room," said Bucha, who is also a former president of the MOH Society. The MOH continues to make headlines in the current generation of military personnel and veterans. This week, the MOH was posthumously awarded to Army Staff Sgt. Travis Atkins, who died on June 1, 2007 saving three of his fellow soldiers from an Iraqi suicide bomber wearing the device on a vest. The bomb detonated as the two wrestled to the ground. "Selflessly using his own body to shield his fellow soldiers from the imminent explosion," Atkins saved at least three other people, the White House said in a statement announcing the Medal of Honor. Since 2016, Veterans Advantage has been providing complimentary VetRewards Cards and memberships to all MOH recipients, spouses and widows of deceased recipients. And just this week, long time Veterans Advantage partner United Airlines announced that United is awarding lifetime “Global Services,” its highest travel status, to all MOH recipients. This will enable MOH recipients to fly with a host of additional perks -- more upgrades, better service, and reduced fees and United Club membership -- in addition to the everyday discount on United flights that MOH recipients receive with Veterans Advantage. Special thanks to United President, Air Force Academy graduate and Veteran Scott Kirby, who announced the award. Medal of Honor recipients ring the closing bell at the New York Stock Exchange. 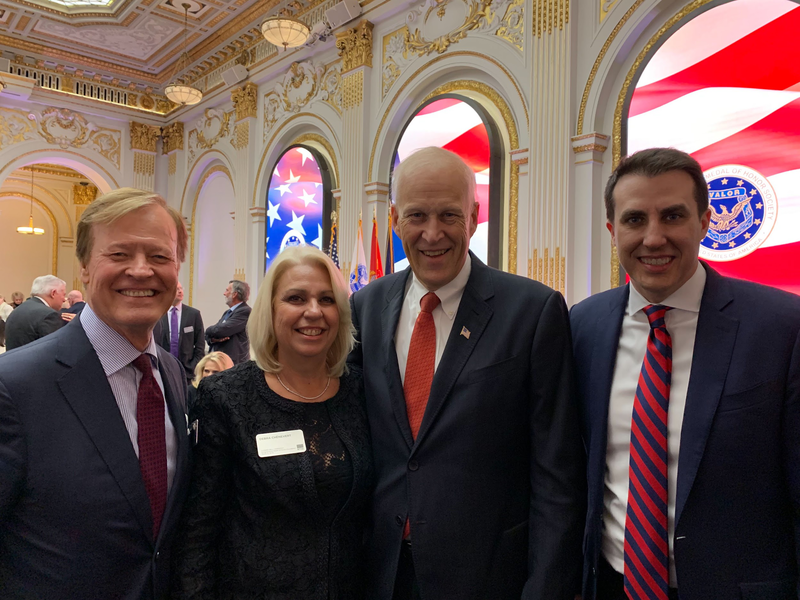 Veterans Advantage co-founder and CEO Scott Higgins with Medal of Honor Foundation Chairman Louis R. Chênevert with his spouse Debra, and New York Stock Exchange Chief Operating Officer John Tuttle (right).